Spread Some Christmas Cheer in October! The Treetime Christmas Creations promotion is upon us once again! Donate your gently-used artificial Christmas tree to benefit Goodwill! Each tree donated will in turn be available for purchase at participating Goodwill Store and Donation Centers in Illinois, and the funds from selling the donated trees and items will provide training and job opportunities for people within those communities. As a valued member of Club Goodwill REwards you'll receive a 50% savings on select ticket locations for any of seven Brewers home games this season! 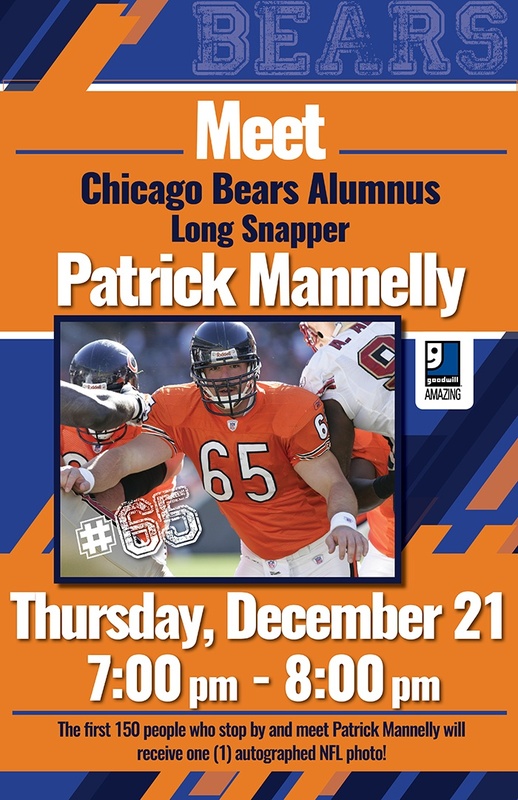 Stop by the Goodwill Store & Donation Center in Mundelein (761 South Midlothian Road) on Thursday, December 21st from 7:00 p.m. to 8:00 p.m. to meet Chicago Bears Alumnus Long Snapper Patrick Mannelly! The first 150 people to stop by and meet Patrick will receive one (1) autographed NFL photo! 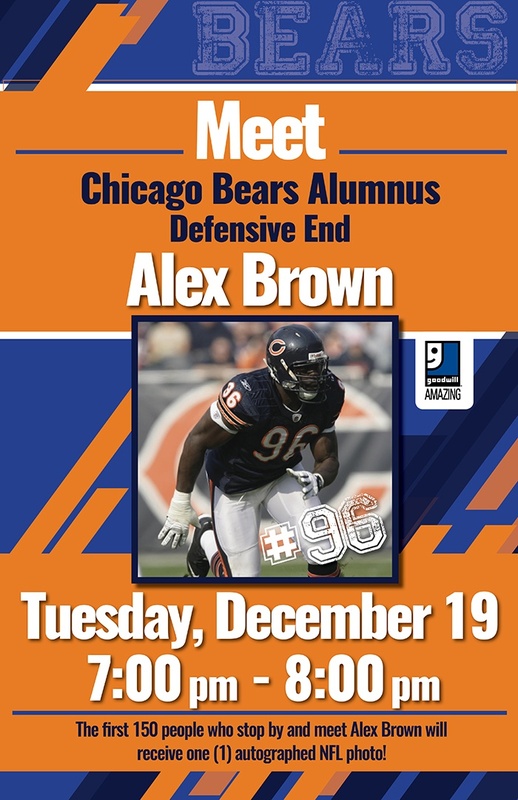 Stop by the Goodwill Store & Donation Center in Lombard (351 East Roosevelt Road) on Tuesday, December 19th from 7:00 p.m. to 8:00 p.m. to meet Chicago Bears Alumnus Defensive End Alex Brown! The first 150 people to stop by and meet Alex will receive one (1) autographed NFL photo! 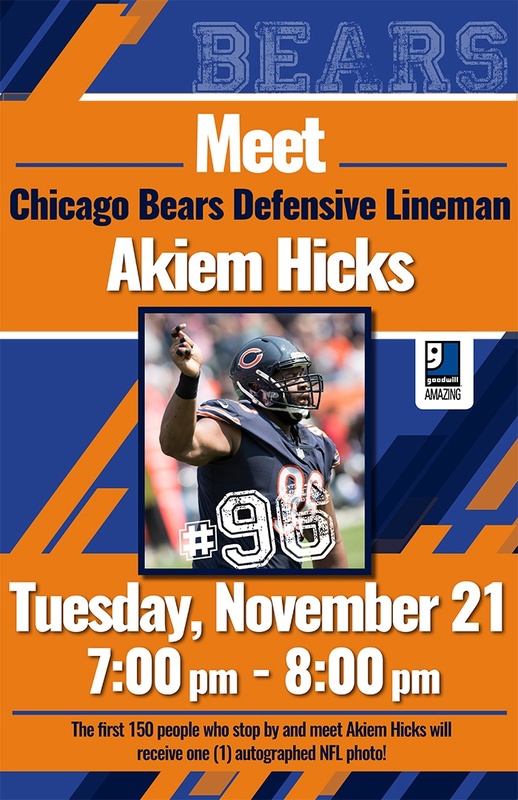 Stop by the Goodwill Store & Donation Center in Lake Zurich (746 South Rand Road) on Tuesday, November 21st from 7:00 p.m. to 8:00 p.m. to meet Chicago Bears Defensive Lineman Akiem Hicks! The first 150 people to stop by and meet Akiem will receive one (1) autographed NFL photo! 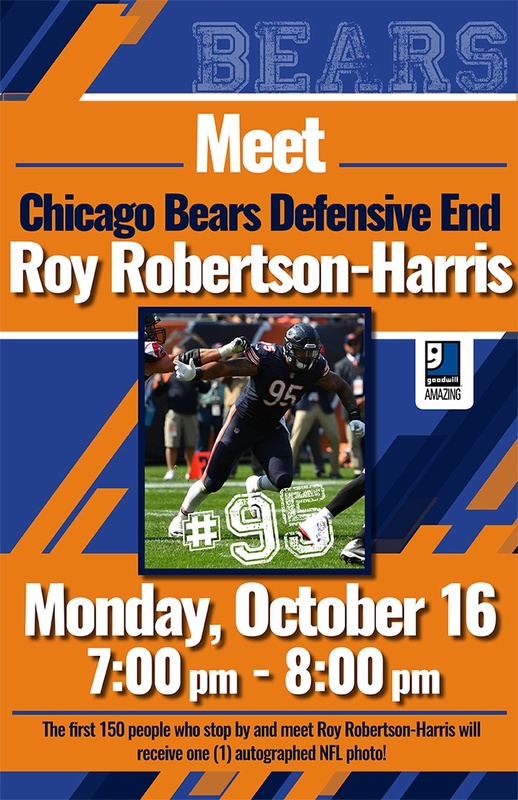 Stop by the Goodwill Store & Donation Center in Northbrook (4131 Dundee Road) on October 16th from 7:00 p.m. to 8:00 p.m. to meet Chicago Bears Roy Robertson-Harris! The first 150 people to stop by and meet Roy will receive one (1) autographed NFL photo! The Treetime Christmas Creations promotion is upon us once again this year! Donate your gently-used artificial Christmas tree to benefit Goodwill! Each tree donated will in turn be available for purchase at participating Goodwill Store and Donation Centers in Illinois, and the funds from selling the donated trees and items will provide training and job opportunities for people within those communities. October is National Disability Employment Awareness Month, and Goodwill Industries of Southeastern Wisconsin and Metropolitan Chicago is encouraging employers in both the private and public sectors to strengthen their workforces by hiring qualified people with disabilities—like Mike, a young man with Down syndrome, who works for Goodwill's E-cycle program. It's a Boo Bash at Goodwill with WSHE! Get ready for a Boo Bash at Goodwill! The WSHE Radio Trick-or-Treat Truck will be visiting six of our Goodwill Store & Donation Centers in Illinois this October. WSHE's Lisa Kosty will host each event featuring either a fortune teller or Halloween make-up artist, candy for the kids, a prize wheel, mini-pumpkin decorating and more! Stop by for your chance to win a pair of tickets to Statesville Haunted Prison and Siegel's Cottonwood Farm (a pair will be given away every 30 minutes). And, ALL entrants will have a chance to win the GRAND PRIZE of a two-night stay at Grand Geneva Resort in Lake Geneva, including a $25 dining credit and two ski lift passes!